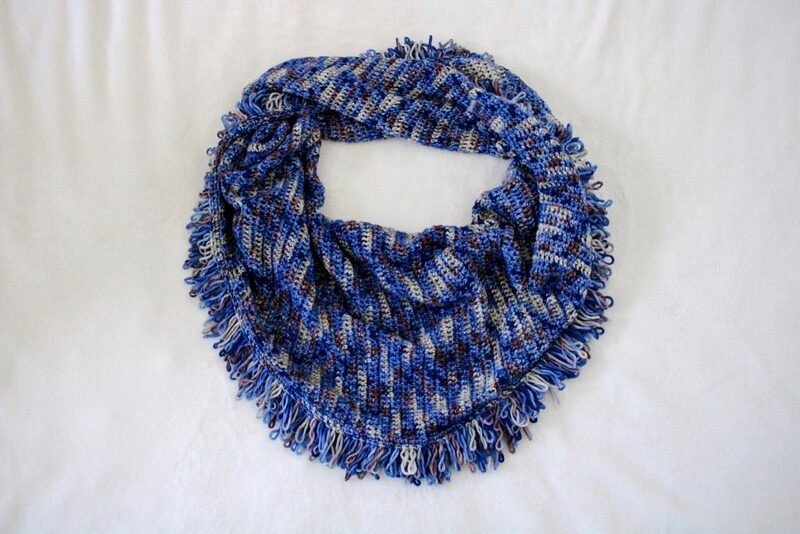 Both fun and functional, the Cara Scarf is an extra long crochet wrap with funky loop fringe. Thanks to my friends at Lion Brand Yarns, I had a chance to use another gorgeous product from their luxurious LB Collection. You may remember when I used their Cotton Jeans to design the Rebel Cami. This time, I tried Anya, a variegated 100% Merino worsted weight wool. 4 skeins arrived at my door and I instantly fell in love. After a lot of debate and learning a new stitch, the Cara Scarf was born! 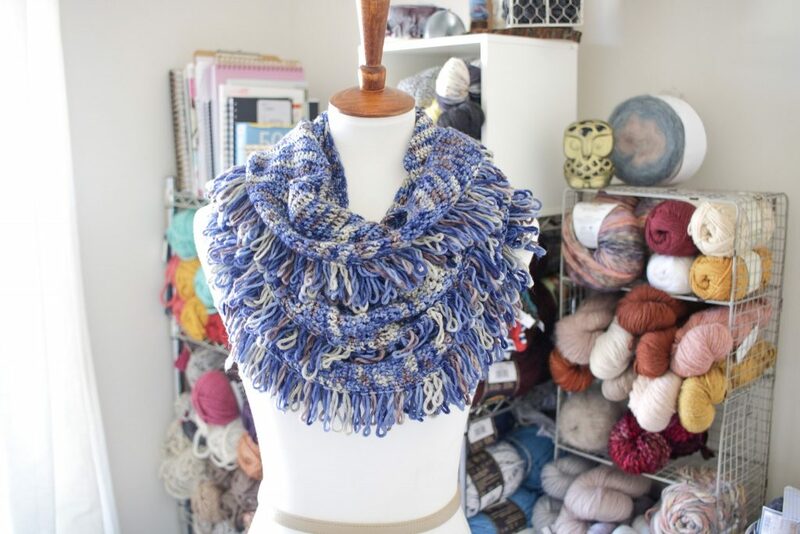 Find a printer friendly, PDF version of the Cara Scarf in my Ravelry shop and on TLYarnCrafts.com. PDF version includes full-color, 5 page instructions. 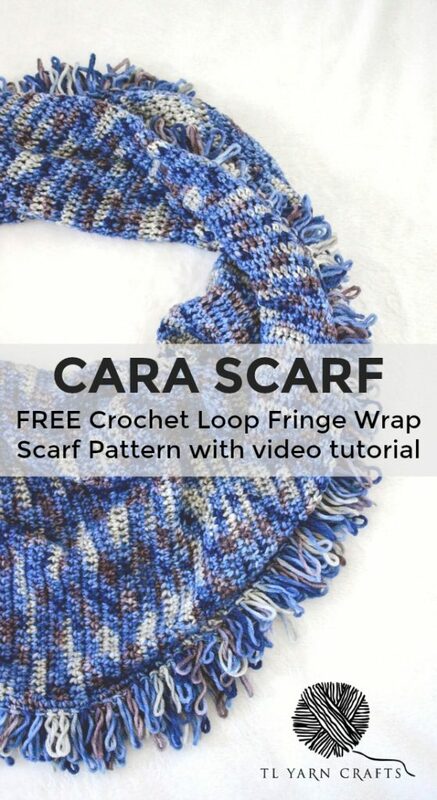 Keep scrolling down for the FREE version of the Cara Scarf! 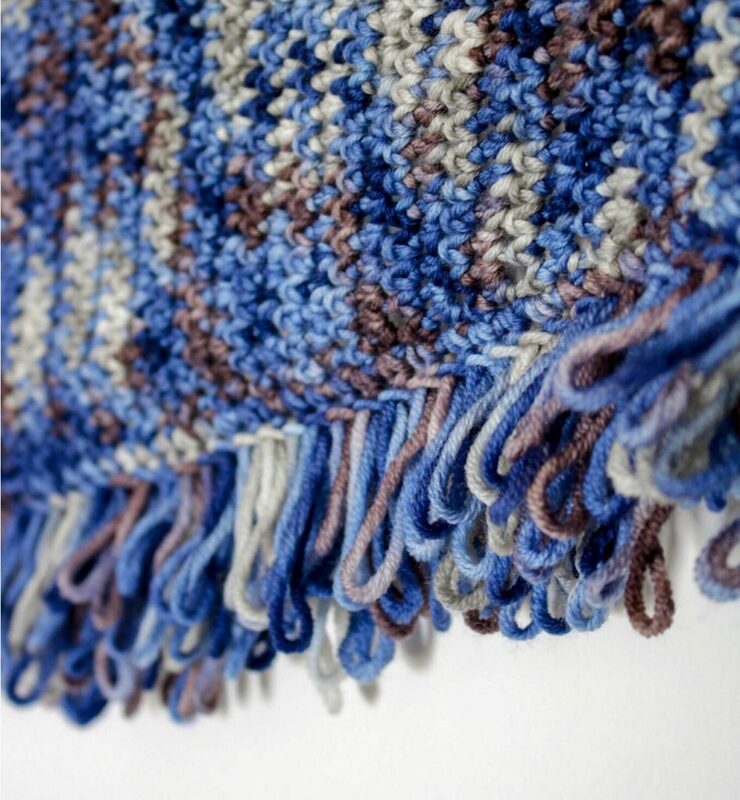 Favorite this pattern and share your projects with me on Ravelry – click here! 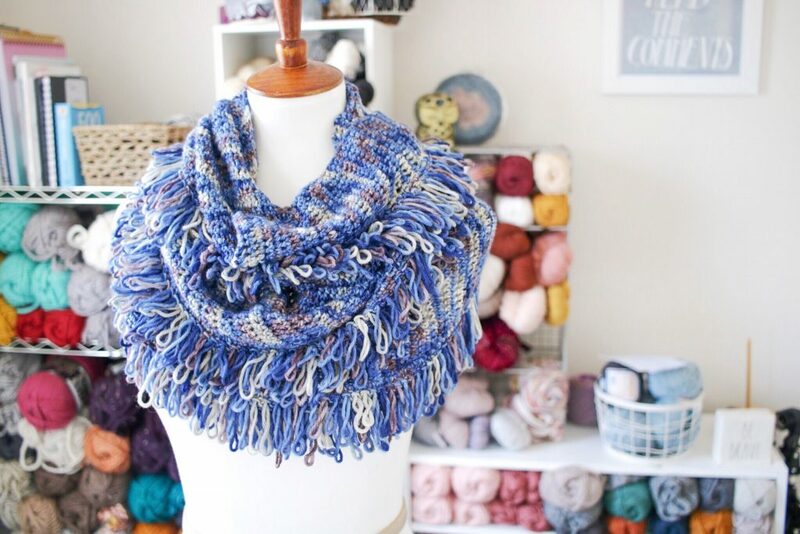 I’m excited to share the new Cara Scarf as one of my first patterns for the 2018 Fall/Winter season. Here in Ohio, we’re living in that weird time when we don’t know if it’s the end of summer or the beginning of fall. Some days are perfect for cocoa and couch cuddling and other days I want to dip my toes in the pool. I’ve been prepping for the final push toward autumn, and the Cara Scarf will be in heavy rotation when I start layering up. One of my favorite parts about this time of year is how the colors transition from summer brights to more muted tones of fall. 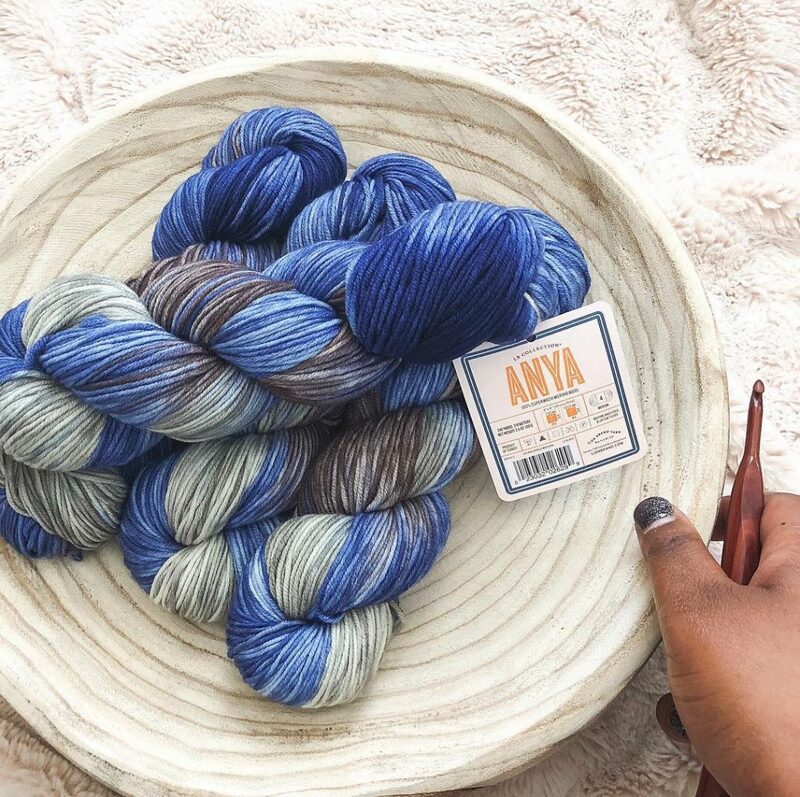 When I was first approached about trying Anya from Lion Brand, I had a chance to pick from their wide variety of shades. I picked Blue Mascara for its rich brown, blue, and off-white tones. I would have gone with something with more pink in it (you already know how I feel about pink! ), but this palette just screamed fall to me. As I continue to design with crochet, I’m gaining much more appreciation for the often overlooked single crochet stitch. When I first tried the craft, the single crochet stitch was a means to an end. 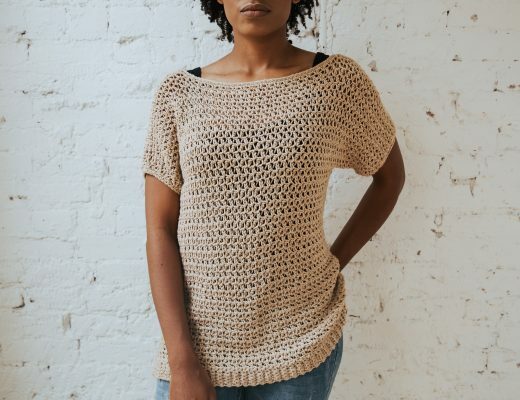 I used it to learn crochet and in more challenging projects, it helped me transition to other more interesting parts of the pattern. Since designing the Flatiron Shawl, I’ve gotten a lot more appreciation for the versatility of single crochet stitches. Specifically in the Cara Scarf, this stitch lends great drape to the body of the shawl and serves as an anchor to the loop stitch for the border. One of the most fun things about being a maker is finding new yarns to play around with. I like to drop into my local yarn store every few weeks just to see what new goodies they have in store. 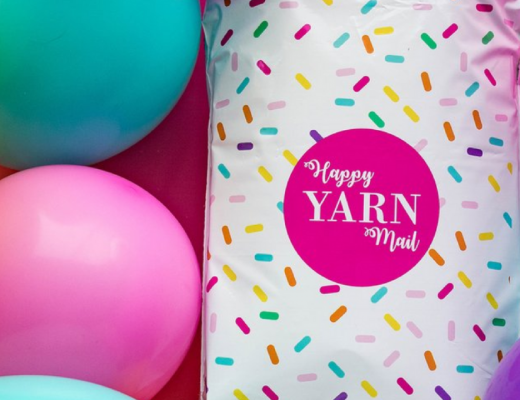 Lion Brand’s LB Collection is like having a local yarn store at your fingertips! Unlike their tried and true products lines sold at places like JOANN, LB Collection is sold exclusively on LionBrand.com. They have a wide assortment of yarns with natural fibers like cashmere, angora, and alpaca. I first got my hands on Anya in the color Blue Mascara earlier this summer. The inspiration for the Cara Scarf came while I was on vacation with my best friend in Miami. 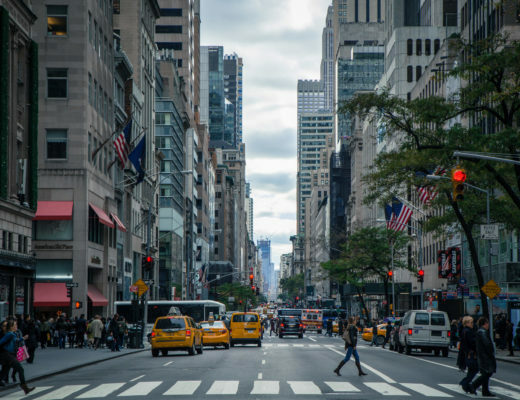 I was so inspired by how the city used color and texture to turn the mundane into magic. I started thinking of how I could pair interesting crochet accents with traditional and recognizable shapes and stitches. After a bit of trial and error, I came up with an idea of a wrap made from end to end with single crochet stitches and an added fringe border. Easy but unexpected. 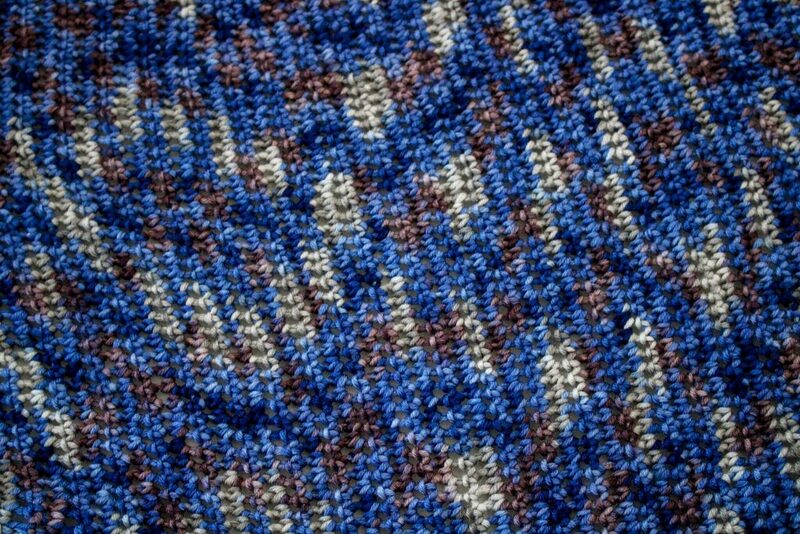 I’ve steadily been transitioning into offering more and more free patterns on TLYCBlog.com. I’m grateful for the reception of projects like the Summertime Tee, the Sand Castle Tassel Scarf, and the Beach Stuff Tote Bag. With the support from my company partners and makers around the world, I plan to offer up many, many more free version of some of my favorite designs. 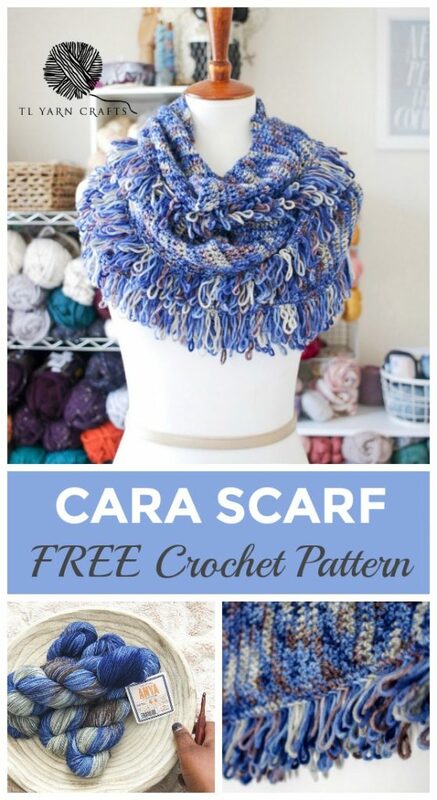 If you want to see more free patterns, be sure to pin this post and share it with friends! 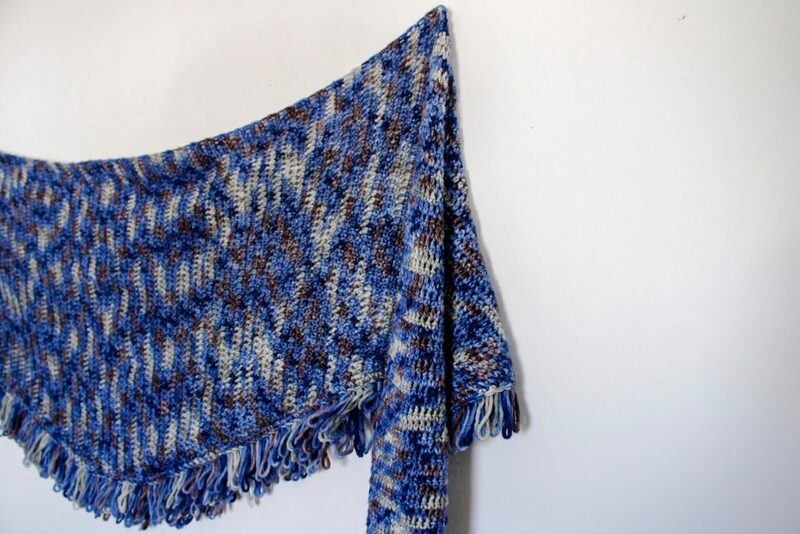 The Cara Scarf uses one of my favorite new stitches, the crochet Loop Stitch. I made a quick video for you to practice if you’ve never tried it. It’s on my YouTube channel, along with other free patterns, product reviews, and crochet tutorials. Check it out! -Numbers in parentheses at the end of some rows indicates the total number of stitches in that row. -Parts of pattern written in crochet shorthand. For example, “sc 1” means to single crochet in the next stitch, “sc 2” means to single crochet in each of the next 2 stitches, and “2 sc” means to single crochet twice in the next st.
ROW 148: Turn. Ch 1. Sc 1, sc2tog, sc across row. Rotate piece 90 degrees to work along row ends. You will work into the row ends of the curved edge, not the straight edge. ROW 1: Ch 1. Sc into the end of each row. ROW 2: Turn. Ch 1. Lp across row. ROW 3: Turn. Ch 1. Sc across row. ROW 4-5: Rep Rows 2 and 3. Step 3: Lay flat to dry, manipulating the loop stitches so they lay flay and facing the preferred direction. 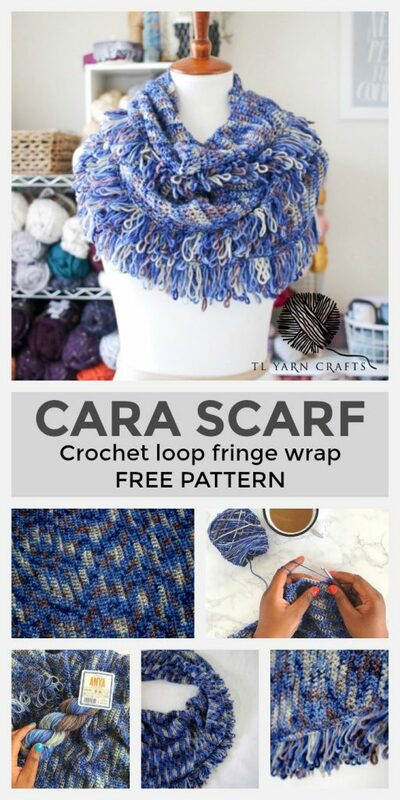 Purchase the printable PDF Cara Scarf pattern HERE! I hope you have just as much fun making the Cara Scarf as I did. 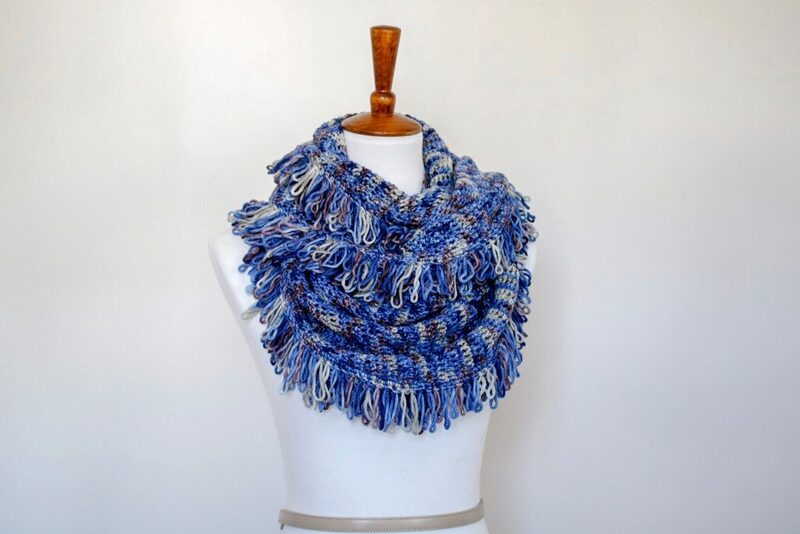 Share your works in progress with me on Instagram and Facebook with the hashtags #CaraScarf and #TLYCMakers for a chance to be featured in my feed! 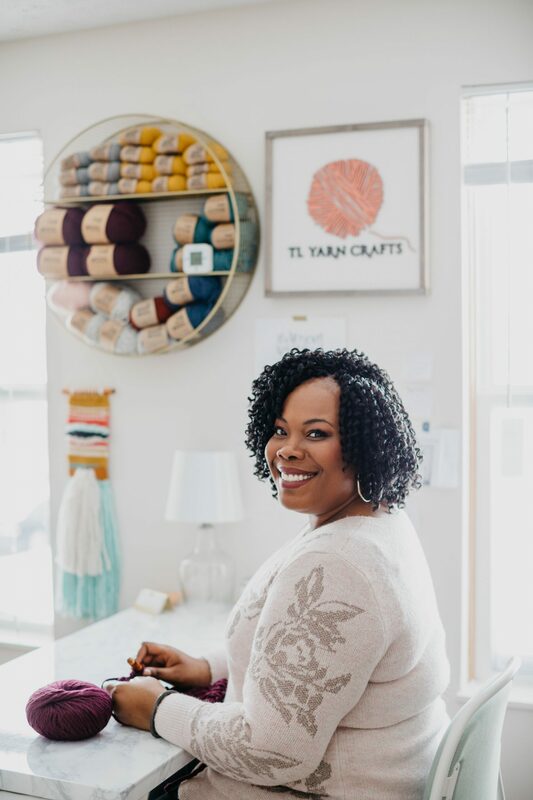 If you’re looking for even more crochet shawls to try, take a look at the Serenity Shawl, the Adore Shawl, and the Free Yourself Shawl.